A great perfume is great all the way down the line. Not only the fragrance itself, but the story, name, bottle, visuals and expression of brand identity. The connection with the wearer never exists outside of that context. And finding enough people to wear a scent faithfully over the years, so that this scent not only survives, but imprints its era, is one of the things that make it a classic, along with its originality and fertility – the fact a lineage can spring from it. Angel is, of course, a textbook example of a perfectly conceived product that went on to become a classic, and one of the rare fragrances that went on to become a blockbuster on both sides of the Atlantic. This year, Thierry Mugler is celebrating its 20th anniversary with a special edition “Collection Cuir” eau de parfum that comes with a star-adorned bracelet, an “Angel Precious Star” limited edition bottle (depicted below) as well as “The Fragrances of leather”, this year’s limited edition: the scent matured in vats containing pieces of leather (Alien and Womanity also received this treatment: I’ll get back to that). 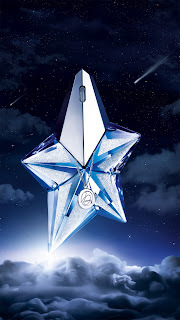 To celebrate the event, Clarins, which has owned the Thierry Mugler license since its creation, gathered perfume and beauty bloggers at the headquarters of Clarins France to blow Angel’s twenty candles and gorge on blue cotton candy, cake with blue icing, blueberry cupcakes and various azure-tinted candies. Two utterly charming and knowledgeable ladies were there to tell us the story: Sandrine Groslier, the Managing Director of Clarins France, and Elisabeth de Feydeau, the renowned perfume historian. As I listened to their lively double act, what struck me most was that Angel might have been the first mainstream perfume to explicitly claim a couturier’s personal history as a storyline (which Elisabeth confirmed during the informal Q/A session). His fond memories of funfair sweets, his obsession with the star motif and the world of science-fiction, his fascination with the Strasburg cathedral he saw from his window as a child, and with his mother’s sensual oriental perfume… And last but not least, his past as a dancer: it is only in the Opéra de Paris that prima ballerinas are called étoiles. All these elements are now the stuff of legend, as is the epic development helmed by Vera Strubi who sought out what was the very core of Thierry Mugler’s identity, fought to carry out his vision, imposed a bottle design that seemed impossible, that ended up being so expensive she re-invented the refillable bottle… The outrageous cotton candy accord that the industry sneered at, and which ended up spawning the gourmand family… The Angel road show that brought the scent directly to consumers, rather than a lavish advertising campaign… The cards in each box that enabled women to write back with their impressions. (To read my write-up of Ms. Strubi’s conference, click here). Angel didn’t only spawn the entire gourmand family: it spawned stories. Not only the couturier’s, but also the development’s and further down the line, the stories of every woman who ever appropriated Angel as a signature scent and wrote back to the brand – starting with Sandrine Groslier herself, who discovered Angel as a teenager. 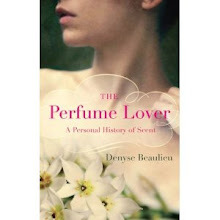 Elisabeth de Feydeau’s presentation set these within the wider context of perfume history. She pulled one of Angel’s scented strands by telling us the history of patchouli, a material that took on different meanings throughout the ages. First, the scent of imported cashmere shawls in the mid-19th century. 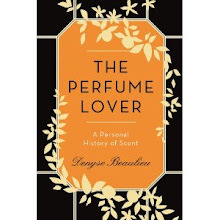 Then, the sensuous sillage of courtesans – the French expression “ça sent le patchouli” (it smells of patchouli) being synonymous with “ça cocotte” (cocotte meaning “loose woman”, but also “it stinks”) to express the strong, cheap scent worn by harlots. Patchouli went on to become an essential ingredient of the chypre family, before transmogrifying into an exotic headshop waft in the hippie era (Aromatics Elixir, which featured it prominently, played the Flower Child card when it was launched). 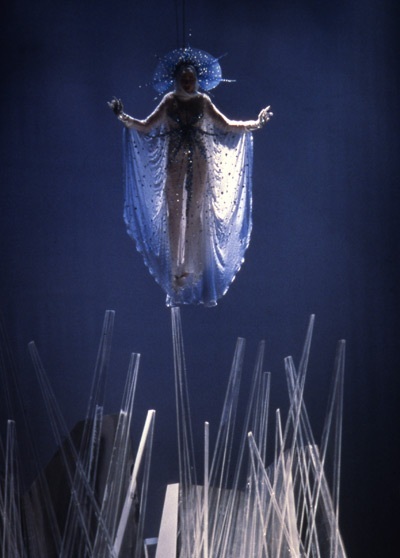 Elisabeth believes that today, since we’ve since been submerged by gourmand scents, patchouli is the angle that can draw new consumers into Angel: the strong olfactory structure that balances out the sweet cotton candy note, and expresses both the sensuality of Thierry Mugler’s mother’s oriental perfume, and the couturier’s über-structured, corseted and shouldered tailoring. She went on to explain that originally, Angel’s press kit didn’t give out the names of materials, unlike most perfume brand communication in the 80s. It focused on the facets inasmuch as they pointed towards the story. Again, this struck me: If a perfume has a strong enough story, it doesn’t need to go into a song and dance about this or that raw material. In many cases, that type of PR routine seems like a default option – unless of course the scent is literally structured around a specific note in which case the material can legitimately become the story. Angel’s strength is not just what Angel smells of: it is its story, and its capacity to generate stories because it springs from a genuine, personal story, supported by stellar teamwork and a visionary brand. No wonder Angel still gives wet dreams to every perfume marketer on the planet… But which cosmetics behemoth would have the balls to trust their team’s instincts that much today? The story is wonderful and inspiring. So many women I know are passionate and devoted to Angel and I can see why. I am going to ask each one if she sent back her note card and what did she write. What a wonderful read you gave me. Lanier, my pleasure! I'd also be curious to know whether they wrote back -- lots did at the time, I am told, but back in the mid-90s internet was a lot less common so people had more reasons to put pen to paper. Apparently Clarins has files and files of those stories, drawings, collages, etc. Marla, yup, I've had that encounter with the Angel of Death... Oddly, though I've never worn any Mugler fragrance other than for testing purposes, I'm a fangirl as well. It's practically the only mainstream brand that's not afraid to take risks. 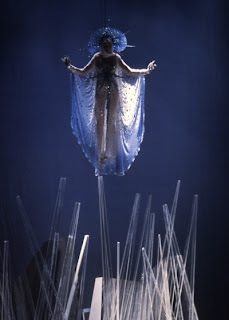 I had a sample spray vial of Angel that I brought with me on my first trip to Paris in 1993. I loved it, purchased my first bottle when I returned home, and since have associated it with Paris. Little did I know it would become such a great hit and classic. Karin, buying a fragrance in a new city and associating it with the trip is one of the loveliest ways to experience perfume, isn't it? A Sales Associate who launched Angel here in Montreal told me that they were told specifically not to talk about notes... they were to hand out the scent strip and ask the potential buyer what Angel reminded them of. Innovative in ALL aspects... down to the sales pitch. Normand, true, the sales pitch was very special. I've also heard SA were trained to be able to talk about *their* associations.